Summer is the most popular time of year for people to begin putting their houses up for sale. So as the weather begins to warm up, you may be thinking about moving. Once you decide to sell your home, it becomes just another product within the housing market. In order to beat out the competition, you need your product to be the best one out there. Here are some things you can do to prepare your home before listing it. Leaving out any clutter can make a room seem smaller, regardless of whether it’s on the floor or sitting on the counter, so pick up and put away everything. While cleaning, separate your items into keep, donate or sell, and throw-away piles. If you are having trouble making decisions, decide whether or not you think it’s worth it to pay to have that item shipped to your new home. Don’t just hide things in your closets because potential buyers looking at the house will open them and you don’t want them caught in an avalanche of your ‘stuff’. Keep furniture to a minimum to create a nice flow throughout the house. Bulky furniture can make a room look smaller and it’s hard to navigate around during an open house. If necessary, rent out a storage unit to use while the house is being shown. You may love your bright red dining room but, for the most part, buyers don’t. Make sure all the main living areas are neutral colors. At the same time, avoid using too much white because it can feel sterile and cold. A mixture of grey, beige, cream, and tan will warm up your home without being over the top. For the bathrooms, pale greens and blues are a good way to offset the cold metal feel of the room. You want prospective buyers to imagine your home as theirs, which can be difficult with photos of your family vacations covering the walls and kid’s trophies on the mantle. Remove all personal items throughout the home and repair any holes in the walls as a result from hanging photos. Keep décor impersonal and minimal, like flowers, candles, nonspecific pictures, and plants. Secure any items of value, such as jewelry or cash in a safe place while people are coming in and out of your house. 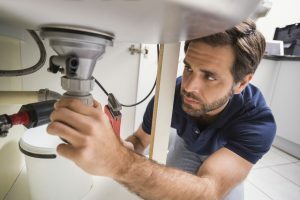 It doesn’t make sense to completely renovate your home before moving, but you can make some small and sometimes inexpensive changes that will make a big difference when you put it on the market. Update cabinet hardware, door handles, and light fixtures so everything matches. Fix the leaky faucets, wash the curtains, and change out the light bulbs throughout the house. Also, take the time to make sure that the bathtub and shower are squeaky clean; a closed curtain or door won’t be able to keep curious buyers away. Scrub the tile and replace the grout if necessary. Although these are all simple steps that can help you get top dollar on your sale, like a lot of home projects, it usually takes longer than you plan and you’ll sometimes discover a much bigger problem. All things considered, you should give yourself about 30 days to prepare your home before putting it on the market. If you are planning on moving soon, make sure to talk to one our trusted mortgage advisors. They will find the mortgage option that works best for you and then be there to help every step of the way. Either visit our website or call (801) 260-7600 and connect with a home loan advisor today.